Pharmaceutical tablets or pills are very expensive products, but not because of the ingredients, instead it is all the overhead that goes in doing all the research, testing, evaluation, approval process, and marketing costs, which gets rolled into the price of each little pill or capsule that has to be recovered. 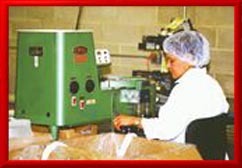 As result these items are packaged with great care and great accuracy. Often times manufacturers sell their tablets or pills in bulk to resellers for a discount. This reduces their distribution costs by keeping the logistics down to fewer destinations, etc. On the left is a bulk hopper with a vibratory feed ramp at the bottom. The amplitude of the ramps vibration is adjustable to control the feed rate of the tablets coming out of the hopper. The tablets coming of the ramp drop onto a rotating clear glass turntable below. The rotation speed is also adjustable to control the rate at which the tablets get driven to the perimeter by centrifugal force. There is guide rail all around the turn table except for one point, which has a little exit chute on the perimeter. A photo eye counts each tablet coming out of the exit gate. Once the target number has been reached on the programmable pill counter and electric solenoid coil closes a little gate on the chute to stop the flow of pills into the bottle. To begin again the operator grabs a new empty bottle and holds it under the exit chute and presses rest on the counter and the cycle begins again. The machine you see above is made by the King Company of England. They were very popular sellers when I worked at Union Standard. I fixed many of them. The yellow device you see in the photo on the work bench is a Fluke Oscilloscope meter. I used this to check the quality of the electrical pulses coming from the photo sensor to the counter. I would look for an output of clean cut square waves to make sure there was no distortion or electrical noise, which might cause miscounts or skips. These machines were cute and fun to work on.